That’s how long it has been since I have been living with an ostomy. That’s close to 20% of my life. Now after spending more than half a decade without a colon, where does that leave me? How do I feel about the new life I have? 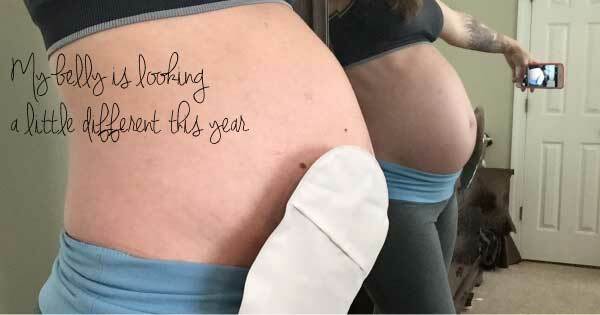 My outlook last year was fairly grim, after I had just spent a week in the hospital due to an intestinal blockage during my pregnancy. But things are different this year. Even though I have dealt with a few issues since my surgery in 2012—inflammation in my eyes, having the rectal stump removed due to lingering inflammation, intestinal blockages during both of my pregnancies—I have not had any true recurrence of IBD since my surgery and have not taken any IBD medications since that time. Do I love my ostomy? Nope. 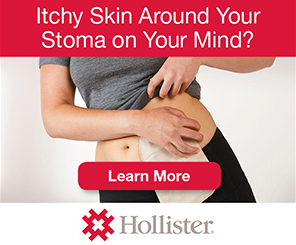 My goal here is not to shout out, “Having an ostomy is the best thing ever!” Because it’s not. 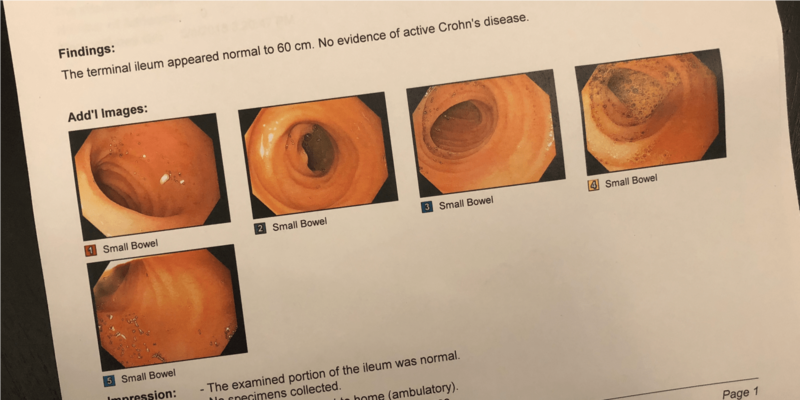 But last week I had an ileoscopy (think colonoscopy without the colon), and afterwards I received the best news that anyone with IBD can get—no signs of disease activity! And that, my friends, is what makes me want to shout from the rooftops. It has not always been an easy road with my ostomy and I still have a love-hate relationship as I continue to grapple with feeling self-conscious or concerned about leaks or worried how others will react to it, but ultimately those pale in comparison to the memory of needing to use a walker to get myself to the bathroom many, many times during the day and spending more nights than I want to count in a hospital bed. I still don’t recommend surgery as a first choice in treatment, since I think most people need time and the opportunity to explore other options before committing to this one. I know I did. But when my lab results look like this (Sedimentation rate is a marker of active disease. 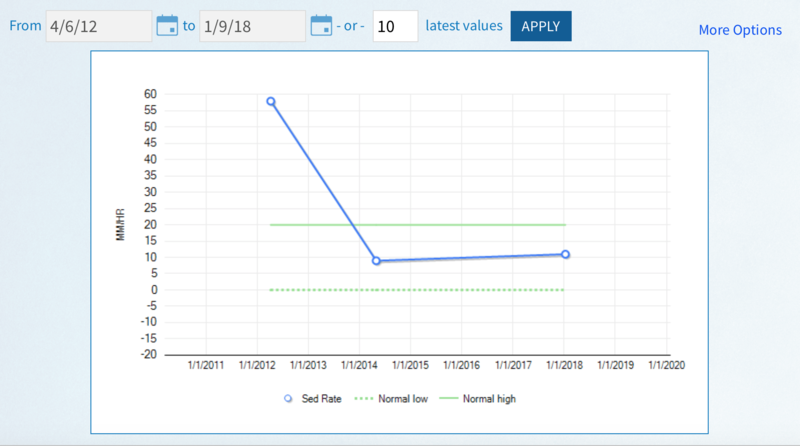 That crazy outlier is from one month before my surgery.) and can keep me off meds and out of the hospital (at least for the most part), I’m going to say that it was the right decision for me. That’s how I have been able to embrace this new life, even with all of difficult parts that come with it. And looking back now, 6 years later, I do not regret it for a second. A QUICK NOTE ABOUT HAVING AN ILEOSCOPY: This is my second scope since my surgery in 2012. I had one in 2014 and now in 2018. I also had an upper endoscopy performed this time. I have had these done as a preventative measure. We know that if symptoms start to arise, the faster we can start treatment the better your odds of getting back to remission. And often, signs will be seen in blood work or through a scope before they manifest into physical symptoms. So I decided to try my best to stay on top of things and not give any inflammation or disease recurrence the chance to sneak up on me. My GI and I have a plan for annual appointments and blood work and doing a scope every 3-5 years. Thankfully an ileoscopy is a simpler process than a colonoscopy since the prep is not required! Three years… 1095 days… That’s how long I have now been living with my ostomy. As usual, it’s one of those mixed feelings of “seems like forever” and “feels like only yesterday.” It’s amazing to look back over these past years and realize how much my life has changed. In a lot of ways, I feel like 3 years ago is when my life started. Prior to my surgery, I felt so trapped and afraid. I feel like I lost so much of my 20s, which is supposed to be the time where you are able to be free and to experience all that life has to offer. But I feel like I didn’t have that chance. Now don’t get me wrong, I had a lot of really amazing things happen in those years, but I also missed out on a lot of things. So after I had my surgery, it truly felt that I was in control of my life for the first time in a very long time. When my husband and I first started talking about having a baby, I was hesitant. I remember thinking that I had been robbed of much of my 20s and I finally felt like I had my life back and I wasn’t sure I wanted to give up that freedom so soon. At the same time, I knew that surgery can complicate getting pregnant and I didn’t want to wait for too long. But once we decided to go for it, I was ready and I wouldn’t change a thing now that it’s all actually happening. But there is still this small part of me that feels like that time was too short.